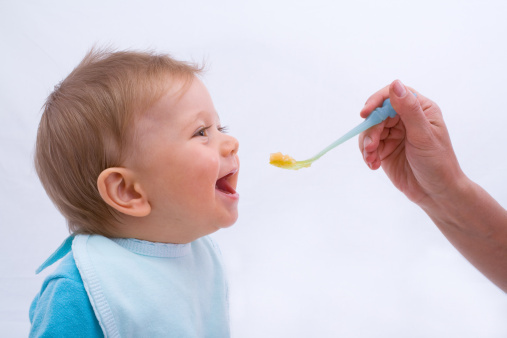 Weaning advice from the NHS on introducing your baby to solid foods. Introducing your baby to solid foods, often called weaning on to foods, should start when your baby is around six months old. It is a really important step in your baby’s development and can be great fun to explore new flavours and textures together. To begin with, how much your baby takes is less important than getting them used to the idea of eating. They will still be getting most of their nutrition from breastmilk or infant formula. Babies don’t need three meals a day to start with, so you can start by offering foods at a time that suits you both. Gradually you’ll be able to increase the amount and variety of food your baby eats until they can eventually eat the same as the rest of the family, in smaller portions. Research shows that babies need nothing but breastmilk or infant formula for the first six months of life. This gives a baby’s digestive system time to develop so that they cope fully with solid foods. This includes solid foods made into purées and cereals mixed with milk. If you are breastfeeding, feeding only your milk up to around six months will give them extra protection against infection, and it will continue to protect them for as long as you carry on. Whether your baby has breast milk or infant formula, waiting until your baby is ready for food will save a lot of time too, as they will quickly be able to feed themselves and with less mess, as they will be able to swallow properly. Every baby is an individual, but there are three clear signs which, together, show your baby is ready for solid foods alongside breastmilk or infant formula. It is very rare for these signs to appear together before your baby is six months old. They can stay in a sitting position and hold their head steady. They can co-ordinate their eyes, hands and mouth so that they can look at the food, pick it up and put it in their mouth, all by themselves. They can swallow food. Babies who are not ready will push their food back out, so they get more round their face than they do in their mouths. These are normal behaviours and not necessarily a sign of hunger, or a sign of being ready to start solid food. Starting solid foods won’t make them any more likely to sleep through the night. Extra feeds are usually enough until they’re ready for other food. Always stay with your baby when they are eating in case they start to choke. Allow your baby to feed themselves, using their fingers, as soon as they show an interest. Don’t force your baby, wait until the next time if they are not interested this time. If you are using a spoon, wait for your baby to open their mouth before you offer the food. Your baby may like to hold a spoon too. Cool hot food and test it before giving it to your baby. Don’t add salt, sugar or stock cubes to your baby’s food or cooking water.